Cedar Dale was located just south of what today is known as Bloor Street and was bounded by Park Road and Wilson Road with frontage to Lake Ontario. It was not a part of Oshawa until the early 1920s. Prior to this date, Cedar Dale was designated a “Police Village”, separate also from East Whitby Township. Many local historians credit the creation of Cedar Dale to one man, A.S. Whiting. This rather noteworthy credit is given to Whiting because he chose to build his new manufacturing business south of the other industries found in the Oshawa area. Mr. Whiting even brought in people to work at his new factory from his home state of Connecticut. In fact, Whiting is even credited with naming Cedar Dale. The Ontario Reformer for Friday, May 7, 1873 credited Mr. Whiting for the existence of Cedar Dale. According to the article, it was “through the establishment and enterprise of the Cedar Dale Works” that Cedar Dale now exists. The plant not only brought work and thus income to the area, but it brought people to work at the plant and make their homes near by. Whiting Avenue was home to many of the employees who came to the area to work for Mr. Whiting. 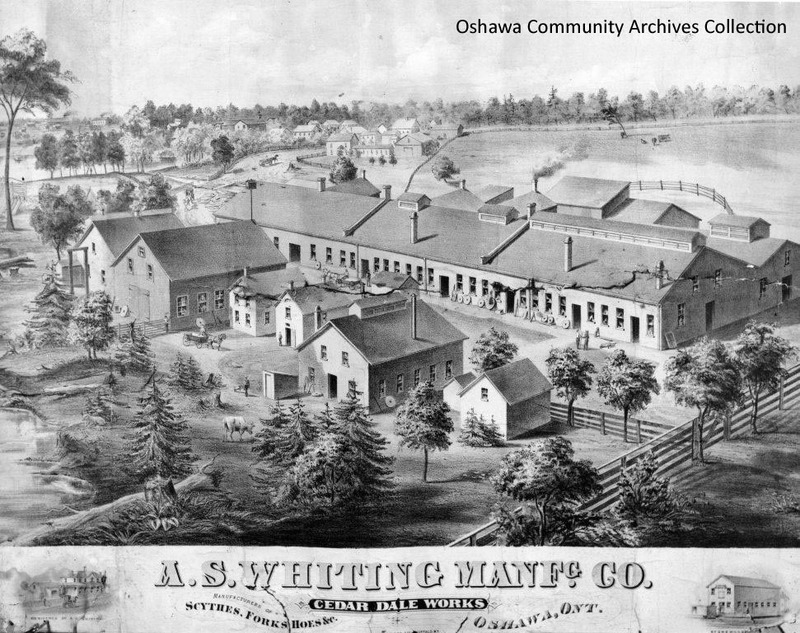 In 1852 Whiting formed the Oshawa Manufacturing Company with several other stockholders. This new company was located just north of what is now Bloor Street. The company was successful for the first few years of its existence; however, the general stock crash in 1857, which followed the Crimean War, led to financial difficulties in the Oshawa Manufacturing Company and Mr. Whiting turned to Joseph Hall for assistance. Concerning this arrangement, Whiting was later quoted as saying “I thought I had caught a big fish in Joseph Hall; so I did, for he swallowed me.” In 1858 the company failed and the stockholders lost all they had invested. From the ruins of the Oshawa Manufacturing Company came the Joseph Hall Works, which was started after this failure. In 1860 Whiting decided to return to the manufacturing business and he rented a part of the Joseph Hall Works and began manufacturing scythes and hoes. In 1862, as the Hall Works continued to grow, there was no more room for Whiting’s operation at the Hall works and so Whiting decided to build the Cedar Dale Works in partnership with Mr. Gilbert and E.C. Tuttle. His brothers Hiram, Homer and Edward joined him with this business venture around this time as well. In 1867 Tuttle sold his interest to John Cowan and the firm became known as Whiting and Cowan. In 1872 the business became known as the A.S. Whiting Manufacturing Co.
On July 4, 1862 Mr. Whiting held a picnic on the grounds beside his new factory to celebrate the opening of this new industry. The Oshawa Vindicator for July 2, 1862 informed its readers that the date, July 4th, was chosen because it was the most convenient for those planning the event and that was in no sense a 4th of July celebration. The factory did not open until the fall of 1862. Upon the death of Mr. Whiting in March 1876, his son-in-law, R.S. Hamlin, took over the operation of the business. This arrangement continued until 1886 when the business was sold to a Mr. Chaplin from St. Catharines. 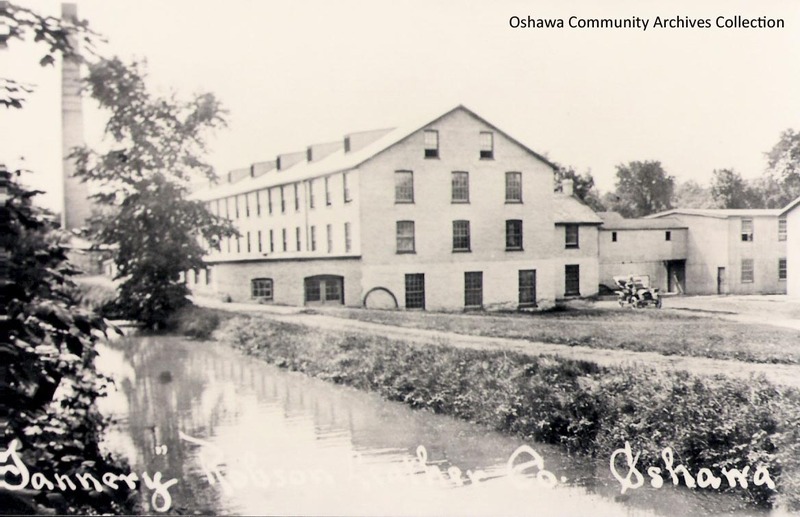 When the business eventually closed for good, the building was left vacant until 1899 when, after a fire destroyed the South Oshawa Tannery, James Robson relocated his tannery to the old A.S. Whiting building. The Robson Tannery was a major employer in Oshawa until it closed in 1977. Part of Robson Tannery still exists as the head office for CLOCA, Central Lake Ontario Conservation Authority. With the influx of workers and other people settling in this area just north of the lake, it was decided to build a school. Some time in the early 1800s School Section No. 2 was built. 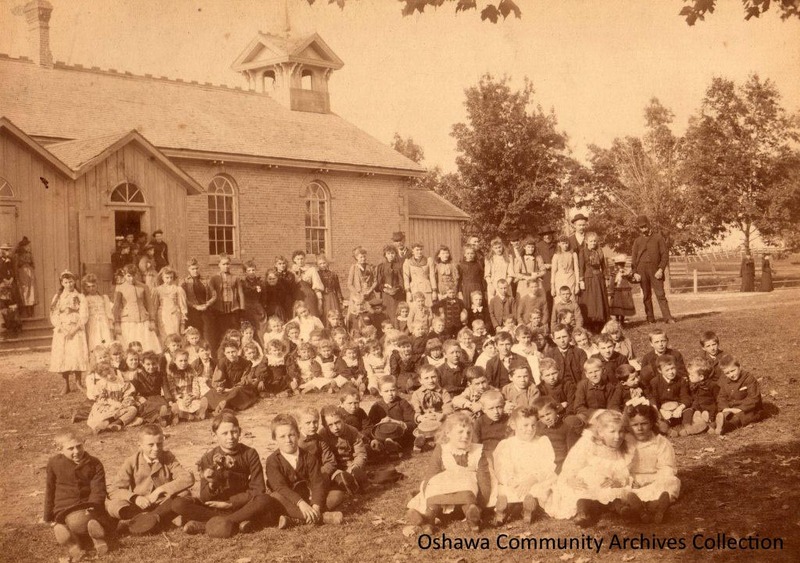 The log school was located on Simcoe Street between the centre of the settlement of Oshawa and the lakeshore. In 1867 a brick school was built and this one room schoolhouse was soon modified into a two-room schoolhouse. This school serviced the residents of the area for many, many years; however, in the early 1900s the growth of the area meant that this schoolhouse was no longer big enough. Plans were drawn up for a new six-room brick schoolhouse to be built across the road from the old school on property owned by Gordon D. Conant. The new school opened in 1920. The school was enlarged just seven years later with two new classrooms being added and once again in 1960. This is the school that we see today located at 827 Gordon Street, just off Simcoe Street. Since the 1970s the school has struggled and on numerous occasions proposals have been put forth to close the school. However, community pressure forced the school board to keep the school open and to make any necessary repairs to the building in order to keep it open. The school was able to celebrate its 75th anniversary in 1995. However, in 2002 community pressure was no longer able to stop the school board from deciding to close Cedardale Public School. The decision was made to close both Cedardale P.S. and Conant P.S. and to consolidate the student body into one brand new school to be called the Bobby Orr P.S. In 1874, the Cedar Dale post office opened. From 1874 to 1889 William Coleman acted as the first postmaster for Cedar Dale. Throughout its history, the Cedar Dale post office had only 8 postmasters, the last one being Mrs. Helen Jane Dixon who left her post in 1952, when the office was closed. The office was located at 706 Simcoe Street South in 1924, shortly after Cedar Dale had been annexed to Town of Oshawa. The final location of the Cedar Dale post office was at 744 Simcoe Street South. The Cedar Dale United Church began as the second Cedar Dale Village School. According to the “Builders’ Half-Moon Stone” found above the front entrance, the building was constructed in 1867. The stone, which is now covered under the stucco, informs us that this was the brick school built to replace the log cabin school. Following the school’s closure, George McLaughlin bought the building and gave it the United Church to become the Cedar Dale United Church in 1927. The present day Sanctuary still contains vestiges of the old school house. The wainscoting around the walls and most of the woodwork is original to the construction of the building. In fact, according to William Watts, author of the book, “A Summing Up: A History of Cedar Dale United Church” many “inscriptions” created by students at the school can be seen on the woodwork. In 1922 the process of annexing Cedar Dale by the Town of Oshawa began. This was a contentious process, with arguments for and against annexation by both those living in Oshawa and those living in Cedar Dale. Discussions actually began several years before the area was actually annexed. Around 1914, Oshawa Town Council approached the village of Cedar Dale about joining the Town. Town Council was eager to have Cedar Dale become a part of the town, as there were government grants available for harbour improvements. In an article published in the January 10, 1922 Ontario Reformer, part of the reason for the controversy in 1922 was the fact that when the town approached Cedar Dale they were not anxious to allow the annexation to occur. However, according to Deputy-Reeve F.L. Mason, they now wanted the annexation to occur as the Cedar Dale school section, along with Westmount, was paying the highest rate of any school section in East Whitby and they wanted to come into Oshawa so that the town would assume their heavy school debt. Many citizens of Oshawa did not see the annexation as a positive step for the Town at that time. According to the Oshawa Daily Times, September 30, 1922, both sides apparently agreed that the growth of both Oshawa and Cedar Dale would be hindered if annexation did not materialize. However, the sides could not agree on the issue of assessment. The residents of Cedar Dale did not want to see their assessments increase to the levels paid by Oshawa residents. The residents of Oshawa did not think that it would be fair for those in Cedar Dale to be given any special concessions in order to suppose the annexation. The issues preventing the annexation were eventually resolved and Cedar Dale became a part of Oshawa by the end of 1922. 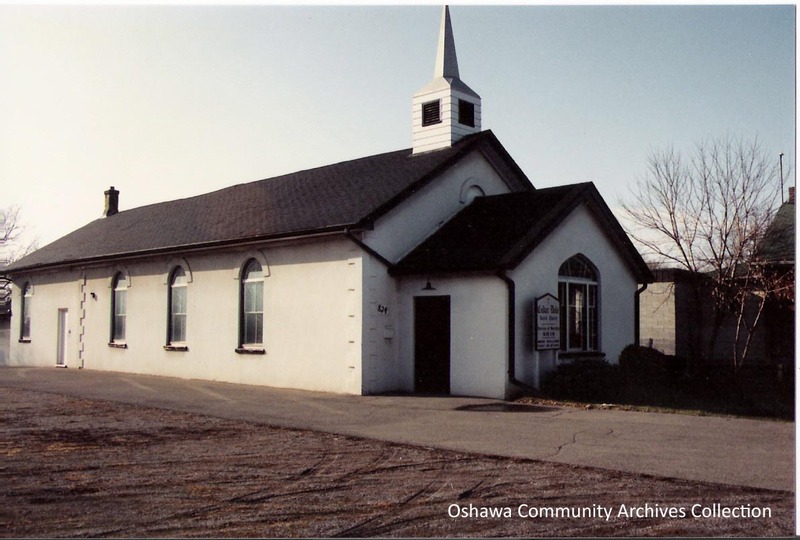 The annexation of Cedar Dale was the start of Oshawa annexing smaller surrounding communities and eventually all of East Whitby Township to create that city that is known today as Oshawa. 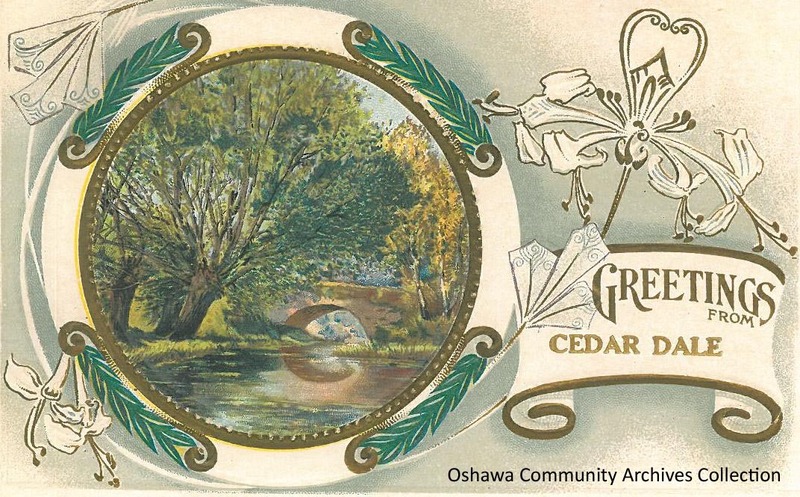 Although Cedar Dale is now a part of Oshawa, it is a still the beloved hometown of those who grew up there. This entry was posted in Around Oshawa and tagged Cedar Dale, Cedardale, Heritage, Historical, History, Local History, Museum, Oshawa, Oshawa Community Archives, Oshawa Community Museum by oshawahistoricalsociety. Bookmark the permalink.